By far the most fundamental belief in Islam is the unity and oneness of God – tawheed. Upon this single idea rests the entire edifice of the Faith as a religion, and from it, stem its moral teachings, its socio-economic and political concepts and the whole of its cultural and civilizational outlook. This belief is very easily identifiable in all aspects of Islamic life; its laws, sciences, arts and the mundane customs and daily behaviour of its peoples.Tawheed pre-eminently implies that the One God is the sole unchallenged originator of this world and is in full control of its affairs and destiny. Furthermore, He is the sole and ultimate authority on its organisation and running; He is the source of the laws and systems and codes that must govern its functioning and regulate its i nter- relationships.Islam is therefore, no more than the way of life chosen and laid down by God for man to fulfil the purpose of organising human life on earth. Islam, frequently translated ‘submission’ or ‘obedience’, is, in reality, total unconditional surrender to the One God. It is a voluntary, but intelligent, and deliberate commitment to acknowledge this overlordship of God in the very minutest detail of man’s own life and the life of all creation.A Muslim expresses this commitment in a simple phrase testifying that THERE IS NO GOD BUT GOD – la ilaha ilia Allah. The whole range of communication between God and man which has taken place since man’s arrival on earth through divinely selected individuals, known as Prophets or Messengers who received divine instruction by means of revelation and inspiration, served the all-important purpose of conveying God’s message to man in its clearest and most comprehensive terms, guiding him through the ever-widening, ever-complex and ever developing stages of his life. The Message itself and man’s response to it over the ages is the story of Islam. The unity of God resulted in the unity of His Message. Adam, Noah, Abraham, Moses, Jesus, Prophet Muhammed (S.A.W) and all other Prophets and Messengers received, taught and lived the same Message. Muhammed’s Prophethood brought to a close all previous revelations, with the Qur’an embodying all the principles and features that would still be relevant and meaningful to the universality of this final divine Message which will prove fitting and reign supreme for all time – till the end of time. A Muslim declares acceptance of this fact by attesting that HAZRAT MUHAMMAD (S.A.W) IS THE MESSENGER OF GOD – Muhammadon Rasul Allah. 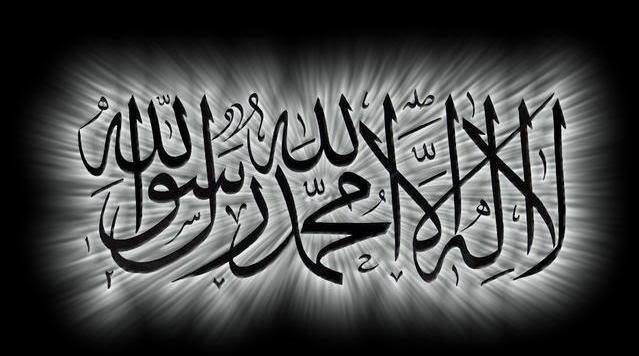 All other human activity within the Islamic way of life revolves around this central pillar of Shahada. 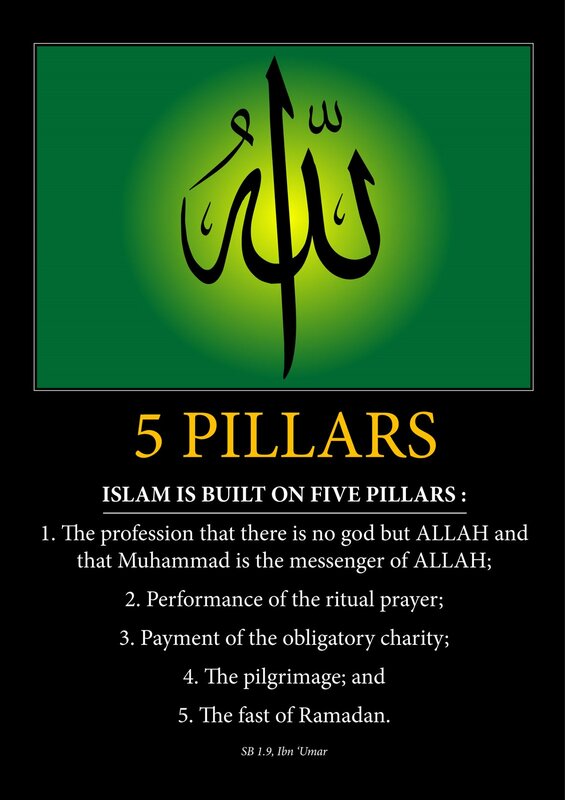 At the heart of this activity also stand four more pillars which represent the essential obligations of the individual Muslim, and practice of which fulfils one’s commitment and submission to the One God. These are: Salat (prayer), Zakat (poor tax), Swiyam -Roza (fasting), and hajj (pilgrimage). Each one of these duties becomes obligatory under certain conditions of age, physical and financial ability and social and intellectual responsibility. When performed regularly and correctly they fit in very easily and harmoniously into one’s daily routine and life-style. In fact, they become the fabric and the web that hold a person’s life together and give it meaning and purpose while allowing him or her to develop their talents, achieve their goals and fulfil their ambitions without having to be a burden on society or a menace to it. Salat is offered five times a day, individually or in congregation. It is a devotional activity to keep man in constant touch with his Creator; to suppress his arrogance, revive his sense of promise and fuel his faculties of goodness, righteous¬ness, courage and fairplay. Zakat is the means by which the well-off and the ‘haves’ of society can preserve and ‘purify’ the wea Ith wh ich God had entrusted them with, having lawfully and deservedly earned it. They are asked to spend a small proportion of their surplus wealth on causes that are beneficial to society as a whole, such as sup¬porting the poor, the needy, the disabled, the oppressed and the lone!y, or contributing to collective and public projects such as building places of work, education and care. It is a self-imposed tax. Swiyam is an Islamic activity which is devoted to God alone. From dawn to sunset every day for thirty consecutive days (the whole month of Ramadhan, the 9th month in the Muslim calendar), a Muslim voluntarily gives up his eating, drinking and sexual habits and undergoes a deliberate training programme of self-discipline and moral upgrading – all for the one single aim of invoking the pleasure and the grace of God. Hajj is a journey set out for the worship of God to achieve and foster the well-being of man. Most of the Muslim’s actions during the Hajj are symbolic but their significance and effect a re most profound. While pursuing his own personal goals in hajj, a Muslim is brought face to face with the life size reality of the universality of his way of life and the unshakable brotherhood of his race – the human race. These practices constitute the solid central core of the Islamic way of life. Their social, as well as religious and spiritual, significance is self-evident and they represent the minimum requirements which go to make a practicing Muslim. They are accepted, executed and experienced willingly on the person’s own initiative, in complete freedom, without the daunting authority of a ‘clergy’ or ‘the Mosque’, or the impertinent interference of the State, in accordance with the Islamic principle of man’s accountability to God alone. Through His Prophets and Messengers, God revealed a life-style based on the equality and brotherhood of man, the sacredness of human life and property, and the just and inherent right of everyone to seek happiness and fulfil their ambitions in this life. For a human society to adopt this life-system, a cohesive family structure, well-defined moral and behavioural principles and comprehensible humanly attainable values and criteria are absolutely vital. The Islamic way of life is one consistent whole, fostering both material advancement and spiritual uplift.